After searching for data on the number of Americans who have earned college and technical degrees, I realized that the numbers are not precise and vary depending upon your source. What is undeniable is this: We have significant gaps in the number of Americans earning both college and trade/technical degrees compared with the number of jobs that will need to be filled. This is due in part to the large number of Baby Boomers set to retire in the next decade. It is also true because we as a country are doing a relatively average job of educating, advising and helping our youth (and adults who have been downsized) to figure out what they could be doing for career development and how best to do it. It is easy to blame this on insufficient government funding for education, the bureaucracies that plague the education system or the popular scapegoat, the parents. O.K., there are parents who are enablers, but I believe there is another player in this equation that must be held accountable: the individual. Yes, YOU, the individual. You have a choice in being the victim or the victor. It’s time to take charge of your life and stop blaming others. It’s time for us to attack “entitled dependence” with vigor. There are certainly exceptions for people with special needs, those dealing with mental and physical challenges. These individuals deserve financial assistance and support. I am addressing the entitled folks who simply seem to feed off the system. I have written in the past about the importance of developing options and making informed choices. The problem I have observed is that we simply don’t invest enough time, money and energy in helping kids figure out what career paths not only excites them, but also put food on the table. While it is true that college graduates earn more money and have a higher standard of living over the long haul, not everyone is meant to go to college. This is especially true considering the staggering amounts of college debt that exist today. I will discuss the advantages of a “gap year” in a future article, but I want to turn the focus of this story on alternatives for students who either can’t afford college (at least right away), do not have the skills to succeed in college (as of now), or just aren’t interested in college (at least not as an 18-year-old). According to Tradesmen International, there is a severe shortage of applicants for well-paying skilled labor jobs, and that is predicted to grow through 2024. There are a number of options for residents of Central Pennsylvania that may make more sense in the short term, especially for individuals who simply cannot afford to go to college right out of high school. Here are just a few options: Penn College in Williamsport, the Greater Altoona Career and Technology Center, Triangle Tech in Dubois, Pittsburgh Technical College, South Hills School of Business and Technology in State College, and the Central Pennsylvania Institute of Science and Technology (CPI) in Bellefonte. 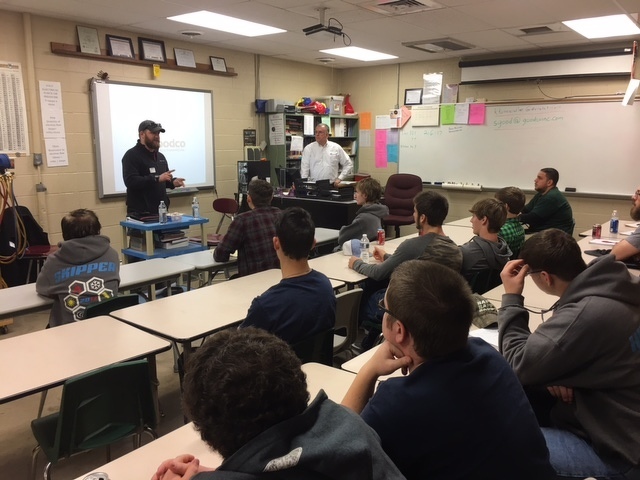 On Feb. 6, I traveled with Scott Good, the owner and president of Goodco Mechanical, to speak to Ken Hassinger’s HVAC class at CPI. We were there to discuss career development and the importance of “soft skills” in the job market. Another speaker, Brian Price, an amazing young man joined us as well. Brian graduated from Hassinger’s class in May 2016 and now works at Goodco, the CBICC small business of the year. But the star of the show was clearly Brian Price, the 27-year old recent graduate from the HVAC class. His journey is worth hearing as it should inspire you to persevere no matter what hand you are dealt. I was so impressed with Brian’s presence and his message at CPI. He is such a great role model for the young students in the class. But I had no idea what I would learn when I asked if I could interview him for this column. It’s both tragic and heroic. He spent eight years in a foster home from age 5 with his great aunt Dolly and great uncle Charlie – a loving but very stern man. His first jobs were at one State College restaurant and as a delivery driver for another. But a lot of the restaurants in town laid off staff when Penn State students left for summer break. Meanwhile he made time to earn his GED. He then picked up part-time work at Redline Speed Shine and worked as a laborer . A crucial turning point for Brian was when he turned 16. Jerry Wheeland (who he refers to as his real dad), a heavy equipment operator, came into his life and instilled a great work ethic in Brian. Jerry is still a best friend. They love fishing together, and Jerry loves being with Brian and his family. At age 18, Brian enrolled at CPI for the first time and tried nursing, but didn’t like it. So he dropped out and did skilled trade work mostly in construction. He was fortunate to get a good job at Appalachian Pre-Fab in Williamsport making parts for the Marcellus shale industry. It was great pay, but it only lasted three years and then he was laid off when the Marcellus hit a downturn. So Brian went back to CPI in the fall of 2015 in their HVAC program after he was able to qualify for grant money and got a student loan. He graduated in May and started full-time with Goodco just four days after graduation. Brian credits CPI and its staff with giving a chance to prove his worth. He became good friends with Hassinger, a friendship that remains strong. Brian started as a residential HVAC installer and was assigned to a great mentor. When his mentor relocated, Brian had such high ratings that Scott trusted him with the group leader position. Scott founded Goodco in 2008 “at his dining room table with his two dogs” and it has grown to just under 50 employees. He said that CPI is a great training ground for the trades, not just for high school students, but also adults looking to change careers or add to their skill set. The professionalism of the staff is what impressed Scott. “It flows from the teachers and administrators who live the mission set by [CPI president] Dr. Richard Makin,” he said. I asked Brian if there was an "a-ha moment" when all his values and attitudes kicked in, or did he always have such a pragmatic approach to work and life? We hear about people who are living as “entitled dependents” and milking the system. Brian is living proof of the good that can come from taking charge of your life. Joe Battista has been an integral part of the Penn State and State College communities since 1978. He is best known for his effort to bring varsity ice hockey to Happy Valley and in the building of Pegula Ice Arena. “JoeBa” is the owner of PRAGMATIC Passion, LLC consulting, a professional speaker, success coach, and the vice president of the National Athletic and Professional Success Academy (NAPSA). He is the author of a new book, “The Power of Pragmatic Passion.” Joe lives in State College with his wife Heidi (PSU ’81 & ’83), daughter Brianna (PSU ’15), and son’s Jon (PSU ’16), and Ryan (State High Class of 2019). 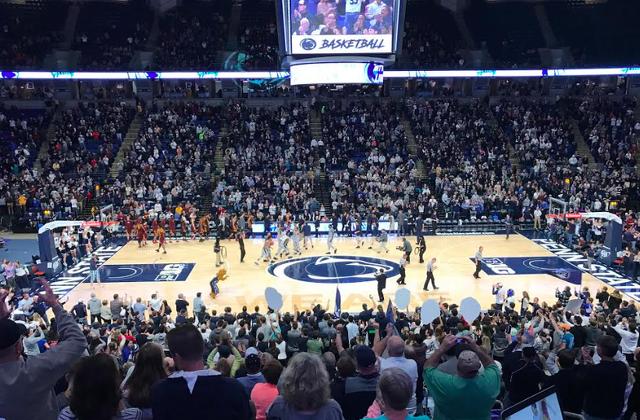 Penn State basketball will be without freshman guard Nazeer Bostick for at least two weeks according to coach Pat Chambers speaking to the media on Monday afternoon.